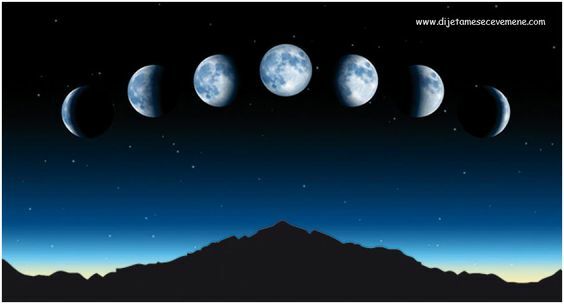 Moon diet has a basic concept of keeping a one day or 24-hour fast on water for the duration of the phases of the moon. This revolutionary method of weight loss is also an excellent detoxification of harmful toxins. This diet for weight loss is quite popular throughout some countries in Europe countries because you can lose up to 2 kg in a day. Also this diet is very cheap to implement. HOW TO KEEP THIS MOON DIET? The ideal scenario would be to begin during the young moon. When it starts, we start our fasting on water also this diet is called water diet. It ends exactly 24 hours after the beginning of the young moon. During fasting mild unsweetened herbal teas and natural squeezed juices without additives can be consumed. Alcohol is strictly avoided, as well as a solid food. Milk and dairy products also should not be consumed, avoid all kinds of artificial additives. NOTE: If during the diet strong hunger appears, drink a greater amount of fruit drinks without sugar. As we mentioned when it would be best to start a diet, this is not a strict rule, since you can start it during some other time. Young Moon- when we look from Earth, the Moon is invisible as it is between the Earth and the Sun. Last Quarter - the position of the planet is the same as with Young Moon and you see the left side of the Moon. For each of the phases the rules are the same – applied is 24-hour fasting. Our recommendation is number 1 because in this way a significantly better result are achieved in the removal of excess kilograms. If you observe everything that we write it is possible to lose up to 2.5 to 3 kg in one phase with regular physical activities. Part of kilograms you lost will return after a week but not be more than 40%. The average you lose is 1.5kg and return 500-600 grams during the week. Moon diet is intended for all of you who are persistent and firm and have decided to lose weight. Although it seems very easy at first, it certainly is not. Go on a walk every day, cycling in nature, because physical activity is recommended. If you have low blood pressure, or low blood sugar levels, moon diet is not for you since it can be hazardous to your health. Be sure to consult with a physician or a nutritionist before this or any other diet. We often get questions here in the comments, and Facebook page that you cannot drink coffee with sugar and the like. General recommendation during moon diet is not to drink coffee during that particular day, especially with sugar, because otherwise all the effort and 24-hour detox plan disappears. So our recommendation is to drink a mild herbal tea instead of coffee if you must, and it is understood without sugar and artificial sweeteners. Fasting with water for a period of one day should not be such a problem, find on the link timetable of moon phases and a complete diet plan for moon diet in 2014. Read other articles on our blog: Un diet, Dukan diet, chrono nutrition, watermelon diet, diet with prunes, banana diet, the Atkins diet, diet with tuna, three-day diet, Mediterranean cuisine, 9 kg diet in 14 days.